The Ming Dynasty inspired design with an elegantly detailed motif features the celebration of the Chrysanthemum in Chinese culture. 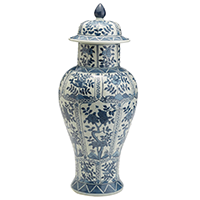 Each Blue and White Porcelain Chrysanthemum Flower Temple Jar is hand painted, glazed and fired at more than 1300 degrees Fahrenheit. Because these are hand made there may be subtle differences from one jar to another. These differences are not to be taken as mistakes or defects but as part of the artistic individuality of each jar. Dimensions: 22 1/2" H x 10" Dia.